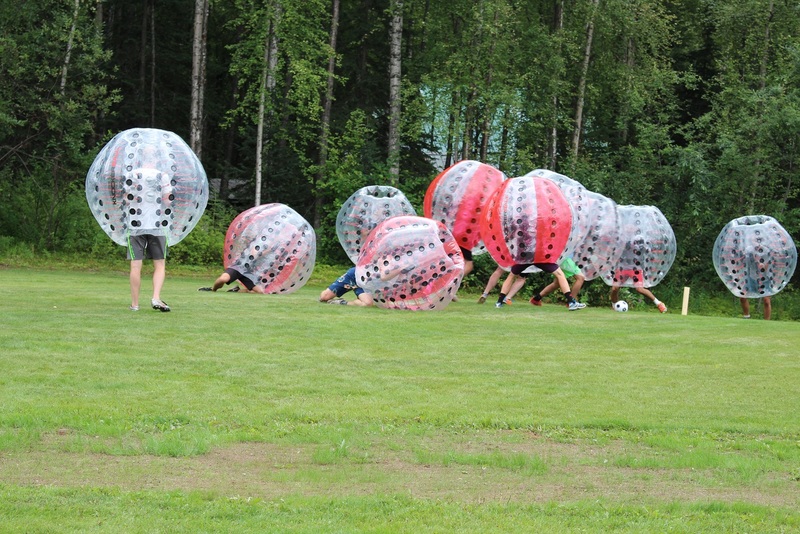 What is Knockerball in Alaska? Glad you asked! Knockerball is an inflatable ball with inner handles and adjustable shoulder straps that you literally wear. You have great visibility through the tough plastic that the ball is made of. Pull this up over your shoulders, strap yourself in and let the fun begin! It’s called “Knockerball” but really its soccer with a very cool twist. Run as fast as you can, try to make a goal, all the while being bumped into and knocked and rolled around by your opponents. We have 12 Knockerballs, accommodating two teams of 6 participants each. Participants must be at least 18 years old. Disclaimer: Alaska’s Heritage Lodge is not responsible for your stomach hurting from laughing so hard! Imagine the absolute blast you’ll have playing and watching your team! Combine this with the gorgeous setting, good food, great friends and laughter till your sides hurt, and you have the perfect place for your event. Rent by the hour for your day event or include it with your lodging package. Call us at Alaska’s Heritage Lodge to find out more! This can be rolled into your day event package or your lodging package. See prices on our Lodging page or call us to create just the event package you need.